The latest concerns for air pollution today is largely due to aerial spraying. Our aerial debris, emissions, and smog now have things like nano composites, G.E.M.S, smart dust, smart motes, and RDIF ID tags...where as this may sound very sci fi for many readers it is the number one growing industry on today's markets. G.E.M.S. refers to micron-scale airborne probes that can monitor all regions of the Earth with unprecedented spatial and temporal resolution. The probes are designed to remain suspended in the atmosphere for hours to days and take measurements of pressure, temperature, humidity, and wind velocity as they are carried by atmospheric currents. The prefix 'nano' means 1/1,000,000,000 of a meter. The particulate matter of something so small is obviously going to go undetected in our normal tests for both environmental and indoor air pollution hazard standards. The following prediction comes from a digital library we cite for information at http://ieeexplore.ieee.org. "Recent and future advancements in materials science and nanotechnology could pave the way for the design and development of hybrid morphing probes that literally merge the life sciences with nonliving mechanical devices, thus creating "partially living probes". These hybrid probes would be artificially intelligent and could change shape and perform different functions using smart materials and structures." Sci fi sounding or not...this is our present day and future reality. The question here is, do we (and especially the technologists creating these nano enhanced materials) really know the hazardous impact on our environment from the unregulated disbursement of nanotechnology? In the following article there is a time line that documents the 'official' position of the EPA and their projections to get these answers..."June 2009: U.S. Environmental Protection Agency (US EPA) develops a text on the Guidelines for Advanced Nano Materials Exposure and Toxicology. It states that the document and toxicological risk assessments on advanced nano materials will be completed in 2013." That is a really long time from the point of contact and exposure that is occurring now! Fortunately there are many individuals from the private sector of science, research, and development keeping a watchful eye and documenting the health and pollution impact. In a related article on our website titled, Introduction to Nanotechnology, /environmental-health/biotechnology/introduction-to-nanotechnology.html, it reports the direct correlation between contact and exposure to nano enhanced aerial emissions and our health. The documentation includes samples of non-biological foreign matter removed from patients reporting a large list of health concerns including but not limited to skin, lung, brain, nerve and circulatory system problems. We have been given expressed permission to reprint the following article on our website and want to thank Dr. Colodzin for making this available.The report was written for the 2010 Health Freedom USA War council webinar that was held on Jan. 2 and 3, 2010. Dr. Colodzin provides a timeline that depicts the who, what, where and when, as we quickly move into an era of great technological advancement and therefore even greater risk of environmental hazards. What is most important here is that we simply MUST have the right to know what is happening and not to harp on some idea of cover up or conspiracy. "None of these space age technologies that are the new whiz-bang toys of aerial spray operations are essentially evil. They each have wonderful life-enhancing applications for which they could be used. It is only a matter of true intent and counter intent. We just need them to be programmed and regulated by a consciousness that values LIFE, that’s ALL." CHICKEN LITTLE 101: A BRIEF PRIMER ON THE HISTORY OF AERIAL SPRAYING AND THE CONSCIOUSNESS OF THOSE WHO ARE DEPLOYING IT. Abstract: We are no longer children with an innocent heart, who have read the story of Chicken Little and how the sky was falling. Well, the new Chicken Little who, graduated from Chicken Little 101 of the world knows that it is true – the sky is falling - filled with not only just molecules of the air we breathe, but aerial emissions, smog, G.E.M.S., smart dust, smart motes, RDIF ID tags, and other debris. It is being sprayed day and night making “X’s, O’s, A’s and other grids in the sky over our global nations cities whether for weather modification, vector control, and/or aerial mass inoculations. Hear this - Chicken Little’s’ - of the world it is time for us to grow up and not be like the wooden boy Pinocchio. We must become real thinking scholars. All of us, who realize that any continuous exposure from even the simplistic contrails of a plane flying over head for long periods of time, will cause you to breathe “bad air,” that will eventually cause lung damage. It does not matter if it is carbon particles or nano composites laced with modified waterborne polyurethane (Styrofoam) mixed with modified food starch as an aerial dispersant. It can make shiny white sticky goo in any healthy lung of an athlete, child, animal or even Chicken Little himself. This paper will outline and address aerial spraying through a time line that depicts the aerial emission events and ends with fellow human being’s thoughts on a simple form of consciousness for those who deploy aerial pollutive materials into our environment’s air, land and water ways. 1949: The first use of aerial spray operations under State and Federal mandates for vector control (insects, virus, etc.) beginning under the Geneva Act for Chemical and Biological Weapons of 1949. 1949 – Present: Many subsequent amendments to the above Act, and parallel U.S. Acts including the 2001 Patriot Act, 2001 Space Preservation Act, and the 2005 Weather Modification Research and Technology Act, have expanded the authority to conduct aerial spray operations over U.S. territory for a wide variety of purposes. 1954-1975: “Vietnam Era” U.S. involvement in Southeast Asia leads to military research, development, and deployment of aerial spray operations for a wide variety of military objectives on the largest scale yet seen, with the application of Agents Orange, Blue, White, Pink and Purple, etc., to millions of acres of Southeast Asian territory. 1974: U.S. Navy Secretary, acting for U.S. Government, patents a highly efficient powder contrail dispersing technology for emitting from high and low altitude aircraft. 1984: The U.S. documentary film SECRET AGENT, brings to U.S. audiences video footage of aerial spray operations in Vietnam and the United States, and interviews it includes with Vietnam veterans and their families about health consequences for people on the ground. 1988: Then-Vice President George H.W. Bush allegedly gives secret orders to the CIA to revive the long-dormant MK-ULTRA mind control division, which had supposedly been ordered shut down by Congress in 1963. This division will reportedly be involved with human-implantable chip technologies, according to allegations made by Dave Larson in 2009 (see Larson in the 2009 Timeline). 1989: The Treaty of Open Skies (TOS) is initiated by George H.W. Bush. This proposal will allow foreign pilots flying on United Nations aircraft to legally overfly U.S. territory; presumably to verify military data as per START international agreements. 1992: The Open Skies Treaty (TOS) is signed in Helsinki (signed for USA by Secretary of Defense, James Baker). 1993: TOS is officially ratified by the U.S. Senate. January 2000-July 2001: Clifford Carnicom receives the first official refusal from the U.S. Environmental Protection Agency for his request to analyze sample(s) collected underneath an aerial spray operation (“Fibrous Substance Sample”; refusal letter requires 18 month response time form date of request. March 2001: Retired U.S. Army General Al Cuppett, a former insider of the Pentagon’s Joint Chiefs of Staff, blows whistle to U.S. military Central Command about the presence of Russian (and possibly foreign national) pilots that are using United nations aircraft for their spray operations, conducted through aerial spray operations above the U.S. mainland. Cuppett alleges this activity dates back to 1993, when the Treaty on Open Skies was officially ratified by the U.S.
January 2002: TOS is officially in force after Russia and Belarus complete their ratification processes. 2001-2006: Samples are collected on the ground underneath aerial spray operations and analyzed by numerous civilian investigators in the USA (Idaho, GA, and other locations), The samples reveal a wide variety of heavy metals, toxic chemical compounds, bioengineered fungi, and other biological active materials in the samples collected. Note: The difference between a contrail and chemtrail is the time limit. Chemtrails last for long periods of time in the atmosphere/skies. 2004: First reports of an anomalous disease dubbed “Morgellons disease,” begin to surface. It is named “Morgellons” because its reported symptoms of fibers protruding from the skin are supposedly similar to symptoms reported in the 1600’s by a French physician named Morgellon. No one seems able to accurately diagnose what causes this mystery disease. 2004-2006: the U.S. Center for Disease Control says that patients reporting these symptoms are most likely suffering from “delusional parasitosis,” and recommends people suffering with Morgellons to be referred to an psychiatrist for mental evaluation. CDC maintains this posture for four years in the face of mounting criticism and contrary evidence. 2006: Samples of fibers and other materials are removed and collected from 24 participants, located in various global locations. All 24 participants are reported to have anomalous Morgellons-like symptoms. The samples were sent to Dr. Hildegarde Staninger (Integrative Health Systems, LLC), and analyzed by four (4) independent laboratories. Initial findings determine that the fibers are silicone based with a two part polyester resin of acryolin and methylmethacrylates. The findings also reveal no biological substances are present. Subsequent findings from these and additional samples taken from individuals within a wide geographical area of distribution all indicate the presence of advanced nano materials (extremely small manufactured materials). The nano materials are found to contain elements of patented weapons-grade nano materials. These weapons grade nano technologies are found in fibers removed from lesions in humans, as well as in fibrous “cotton candy” like material collected on the ground and observed floating down through the sky after aerial spraying operation in Texas, USA. 2006-2008: Center for Disease Control continues to equate “Morgellons disease: with delusional parasitosis, and continues to recommend treatment by a psychiatrist. 2007: Allegations – not confirmed – of a new federal policy allowing vaccine makers immunity from prosecution for damages from aerial spray operations conducting vaccine research on American public without permission (under guise of pathogen/biological countermeasures Homeland Security program). 2008: Argonne Labs Midwest Center for Structural Genomics describes a protein structure they nickname “dragon protein” for its resemblance to a dragon’s head (molecular branding). A similar shape to this “dragon’s head” is revealed in the micrographs of fibers removed from lesions in patients with Morgellon’s symptoms (Dr. Hildegarde Staninger’s, private photomicrograph collection 2006 to present). 2008: The CDC changes its policy about Morgellons syndrome. It stops defining this syndrome as a sign of likely “delusional parasitosis,” and defines it as a condition of unknown origin, possibly associated with Lyme’s disease. CDC announces it is forming a working study group for Morgellons, not due to report to the public until end of 2010 or longer. (Actually, somebody already has built a diversity of nanoscale machine parts. Eight years earlier in ADVANCED MATERIALS, 2000, 12 No. 24. December 15, “Silica Nanotubes and Nanofiber Array,” Dr. Wang describes various silicon based nano tubes that are used in nanotechnology. These are very, very small machines, to small to be seen with the naked eye, which can self assemble into larger machines. Currently these machines are being utilized in SencilTM technology by USC and licensed to Hewlett Packard and other companies. Note the shapes of Nano – Claw, Chinese Lantern, and tongued silicon tubes. These shapes are significant for all Chicken Little students because the same or similar shapes have been observed in micro photographs of materials removed form humans with anomalous Morgellons-like conditions. January 2009 – present: Obama Administration continues aforementioned policies of previous administrations. The consciousness that deploys aerial spraying operations against the American population does not seem to be much affected by the change in administration. March 2009: Dave Larson, former CIA biomedical technology program contractor, alleges that implantable biomedical devices have been deployed domestically for surveillance and torture under secret program reinstated by George H.W. Bush in 1988 and running unchecked and unreported to Congress through March 2009. Also alleges that government polices on the ‘war on terror” and detention were crafted specifically to avoid criminal prosecution for illegal use of these technologies against Americans. June 2009: U.S. Environmental Protection Agency (US EPA) develops a text on the Guidelines for Advanced Nano Materials Exposure and Toxicology. It states that the document and toxicological risk assessments on advanced nano materials will be completed in 2013. June 2009: (6/11/2009) director-General Dr. Margaret Chan of the World Health Organization made the declaration of a Phase 6 “Pandemic emergency” regarding the spread of H1N1 Influenza. Wang, Z., Shao, J., Li, Fl, Gao, D., and B. Xing. “Absorption and Inhalation of Acetylcholinesterse by Different Nanoparticles.” College of Environmental Science and engineering. Ocean University of China. Qingdao, China. Chemical Sensitivity Network. © June 19, 2009. Recent studies conducted by the College of Environmental Sciences and engineering, Ocean University of China, Qingdao, China (Z. Wang, et. al.) have shown that manufactured nanoparticles can be toxic via interactions with proteins and enzymes. Acetylcholinestease (AchE) is a key enzyme present in the blood, brain, and nervous system. Zang et al report significant results of absorption and inhibition of AChE by specific nanoparticle, multi-walled carbon nanotubes, and single-walled carbon nanotubes, showing that these nanoparticles may have neurotoxicity. July 2009: CIA Director Panetta briefs Congress about a secret CIA program never disclosed regarding surveillance and torture, running allegedly “from 2001 until the present.” Congressional investigation may or may not be forthcoming. September 2009: Reuters reported Verichip was given two exclusive patents for biosensors that detect viruses. They will be used as implantable virus detection systems in humans, and will combine with Verichips implantable human radio frequency device to track humans. The scope of this effort is made clear by the University of California – Industry Homeland Security Network notice 9/3/2009 about biological countermeasures (available here) which says that smart dust sensors for removal of surveillance and detection of a variety of chemical and biological agents are the focus of programs at a variety of American institutions. “SMARTDUST” is a generic name for systems that combine nanotechnology, biotechnology, and advanced communications systems (microelectomechanical sensors, or MEMS) for a variety of purposes. The online dictionary Wikipedia as of 2009 defines “smart dust” as “hypothetical” (it’s just an idea, we don’t have it yet). And yet, on its website, the company DUST NETWORKS writes: Dust Networks, the leader in standards-based intelligent wireless sensor networking (WSN), provides ultra low-power, highly reliable embedded systems to the world’s leading sensor manufacturers – market visionaries who recognize that “smart dust” embedded inside their sensors is the star of a paradigm shift in their market. If that isn’t sufficiently convincing as to the reality of smart dust in our current and future lives, you can also check out Major Scott Dickson, U.S. Air Force, in his April 2007 Blue Horizon Paper a the Center for Strategy and Technology, Air War College: ENABELING BATTLESPACE PERSISTENT SURVEILLANCE: THE FORM, FUNCTION, AND FUTURE OF SMART DUST. “SMARTDUST” is way past the “hypothetical” stage. It is increasingly a hidden facet of modern life. October 2009: History Channel presents a documentary entitled “Weather Weapons”. The documentary describes chemtrails and aerial spraying operations since World War II. December 2009: Morgellons Research Foundation, main steam information clearinghouse; for Morgellons patients, lists more than fifteen thousand humans reporting Morgellons symptoms in its database. In an online radio interview (2006), Dr. Hildegarde Staninger reported an estimate of 60,000 symptom bearers in the USA, 100,000 world wide. Databases in Italy have estimated their population to have 5 per day new case, thus 1,825 new cases per year since 2006. December 2009: MEGA CORRUPTION SCANDAL AT THE WHO. In the past decade the WHO, in order to boost funds at its disposal entered into what it calls “public private partnerships.” Instead of receiving its funds solely from member United Nations governments as its original purpose had been, WHO today receives almost double its normal UN budget in the form of grants and financial support form private industry. The industry? The very drug and vaccine makers who benefit from decisions like the June 2009 H1N1 Pandemic emergency declaration. Early efforts underway to develop countermeasures hold real promise. It may really become possible to deactivate and/or mitigate this new modern assault upon our freedom to evolve our bioelectric and genetic capacities without the presence of un-invited parasitic-like machines in our bodies. Ultra-modern and ancient natural healing methods are being applied in far scattered corners of the earth, as we the people begin to realize this is actually happening NOW in many parts of the planet. Our bodies are reacting to it, and it is beginning to look like we may all live downstream of this “stuff” already. None of these space age technologies that are the new whiz-bang toys of aerial spray operations are essentially evil. They each have wonderful life-enhancing applications for which they could be used. It is only a matter of true intent and counter intent. We just need them to be programmed and regulated by a consciousness that values LIFE, that’s ALL. May the Return of the Light – bring purification to even the darkest corners of human consciousness. May we of the nations, tribes, and families find leaders who don’t want to remain silent and profess ignorance when the people are sprayed without permission; may we the people find the courage to defend our future generations, even if at a cost of one family at a time against this war upon the most beautiful creation in all the galaxies – LIFE. Radio Interviews of Jeff Rense with Dr. Hildegarde Staninger, Dr. Rahim Karjoo, Dr. Edward Spencer, and Dr. Michael Castle and Morgellon’s Individuals. 5. www.sciechimiche.com RAI Television show Rebus discussing Chem Trails, Morgellons, Dr. Hildegarde Staninger’s research and other related discoveries © 2007. Appendix B: First Navy Particulate Patent, Barium Definition, HAARP and Con Trails (Chem Trails). US Application Number: US19774000490610 August 12, 1975 / July 22, 1974. Applicant: The United States of America as represented by the Secretary of the Navy, Washington, D.C. US Patent Office, Washington, D.C. Further referenced patents: US1619183* 3/1927 Bradner et. al; US2045865* 6/1936 Morely; US259188* 4/1952 Willcox: US3531310* 9/1970 Goodspeed et al. Production of Improved Metal Oxide Pigment; and USR0015771 * 2/1924 Savage (* some details unavailable). 8. US Patent 4,686,605 Eastland, Bernard J. Assignee: APTI, Inc. (Los Angeles, CA) January 10, 1985. Method and apparatus for altering a region in the earth’s atmosphere, ionosphere, and /or magnetosphere (HAARP). 11. http://us.mc826.mail.yahoo.com/mc/showMessage?fid=Inbox&sort=date&order=down&...Dr. R. Michael Castle. 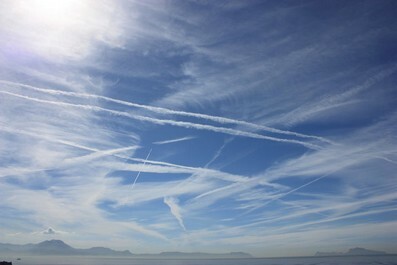 12. http://www.bariumblues.com/haarp_dangers.htm HAARP, Chemtrails, and New War Technologies by Carol Sterritt. © 12/2/2008. 23. Schneider, Phil (A Lecture) Deep Underground Military Bases and the Black Budget. (Human DRG11-Responsive Axonal Guidance and Outgrowth of Neutrite (Dragon) Proteins and Variants Thereof. 26. Woolf, Clifford. US Patent: 20080260736 Methods for Compositions to Regulate Iron Metabolism, October 23, 2008. 30. Staninger, Hildegarde. “Nano Composite Material Exposure through Aerial Spraying causes Increased Acetylcholinesterse Inhibition.” National Registry of Environmental Professionals. Annual Conference October 5 & 6, 2009, Des Plains, IL published Journal of Environment and Sustainability © October 2009.